Celebrating its 40th anniversary since launching as an electronica spin-off in 1975, productronica will again set new standards to promote future innovations in Munich, 10th to 13th November. It's difficult to imagine life without these devices such as smartphones, tablets and laptops. productronica has contributed to the fact that these products exist. After all, producing electronic devices that are this complex is only possible thanks to the constant ongoing development of production equipment and, with it, the electronics-manufacturing sector. Today we use tablets and smartphones in ways that would have seemed like science fiction in the year 2000. And now, they are even being used in production environments, which is also a topic of productronica 2015. The rapid pace of development in electronics is a driving force not only for the production sector as a whole. For instance the foundation for 'Industry 4.0' was laid at productronica in 2001 and 2009. This topic that is now revolutionising the entire industrial and commercial sector and will again play a major role at this year's fair. This year's productronica also aims to give the industry new momentum. The special show, which once again promises to be a highlight, will allow visitors to experience Industry 4.0 live with the help of augmented and virtual reality on five selected electronics-manufacturing machines. For the first time ever, visitors will be able to look into the machines and follow complex processes between machines and workpieces that were hidden until now. Other special shows include the IPC Hand-soldering Competition, the Cleanroom Event Stage and a travelling exhibit on electromobility. Christian Rocke, Exhibition Director, productronica, explains: "We want to show how Industry 4.0 can simplify the lives of the people who work with these machines on a daily basis. This is not only interesting to our visitors, it also means exciting added value for the exhibitors participating in the special show." "Right now we are experiencing the evolution from the built-in touch-panel display to operation using a tablet. Remote maintenance is being simplified considerably," says Dr. Eric Maiser, Managing Director of VDMA Productronics. "If you hold a tablet camera up to parts of a machine, it recognises them and an overlay image appears on screen showing the appropriate maintenance guide or work instruction. 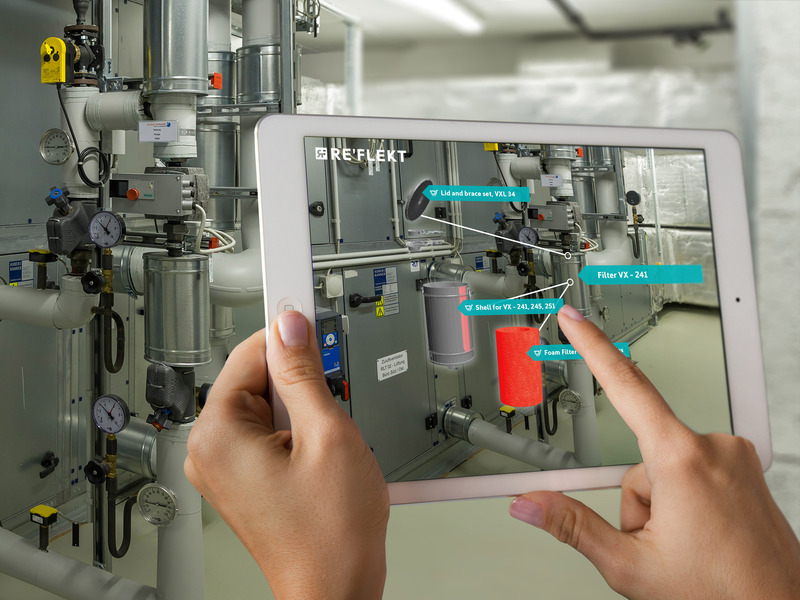 Virtual and augmented reality are already being used in a number of sectors. This field has a great deal of potential for electronics production and the purpose of the special show is to demonstrate some of those possibilities." Other innovations include the new cluster structure, which has integrated the fair's 19 different segments into five clusters which give visitors an overview of the entire value chain in electronics production. Making the fair clearer and easier for visitors to navigate, this new structure includes the: PCB & EMS cluster; the SMT cluster; the Semiconductors cluster; the Cables, Coils & Hybrids cluster; and the Future Markets cluster. The fair's forums have also been restructured: in the future, each cluster will have its own Speakers Corner. The 2015 event will feature over 90 new companies and national pavilions from Austria, Bulgaria, China, Estonia, France, Great Britain, Hungary Morocco, the Netherlands and the United States. "The breakdown of exhibits into narrowly defined segments no longer reflected developments in the electronics manufacturing industry. These clearly defined clusters allow us to bring together what belongs together," adds Rocke. For the first time ever, the productronica innovation award, the electronics production industry's first independent award, will be presented on the first day of productronica. All exhibitors have been invited to compete with one or more innovations that are entirely new or a significant further technical development. The product should be no more than 12 months old at the time of the competition and already be available for sale. Also for the first time, IT2Industry, the trade fair and open conference for intelligent, digitally networked working environments, is being held at the same time as productronica. The industrial IoT is changing the prerequisites for production and manufacturing. The products and services that are presented at IT2Industry demonstrate the link between classic manufacturing and Industry 4.0.
productronica's opening event, the CEO Roundtable on Cyber security: Challenges for the Manufacturing Industry, is on the first day of the fair at 11:00. Leading personalities from the industrial, scientific and political sectors will discuss questions such as How can I gain insights into our security status? and How relevant is cyber security to companies that don't think they have highly sensitive data? Besides focusing on office IT (attacks by viruses and malware), specific aspects of cyber security in industry (smart factory) will also be examined.